So Many of us find it difficult to stand up for ourselves and speak out and feel our courage to live as we would like to. 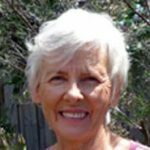 Rhonda has had years of inner struggle with such issues but now with 30 years as a Feldenkrais practitioner, body therapist, voice therapist and singer she has learnt so many ideas and techniques that she loves to share with others. This session is designed to assist you when you sing or speak in public to feel freer to express yourself, to be more open in relationships, to say what your needs are and to put more power behind your words.